I know I say I love a lot of things, but this one is definitely true: I love barbecue! For this reason (OK, more like for several reasons), living in a small apartment in the city has been a bit of a challenge. Charcoal grills are strictly prohibited, and I, for one, am not a huge fan of the pretentious “electric” grill trying to imitate the flavors of real BBQ. It’s just not the same! So, though I’m proud to say I have discovered at lease one awesome BBQ restaurant in Chicago, I’ve been missing my homemade grilling sessions. This recipe, though not exactly authentic barbecue, somewhat filled the void with a combination of fantastic flavors. The carnitas (which I bought already cooked from Trader Joe’s… delicious!) are wonderfully seasoned with a bit of chili pepper and cinnamon for a rare kick. Topped with some yummy homemade slaw and baked beans, eating this meal felt like we were sitting around a campfire telling spooky stories! The only thing missing was some S’mores. In a large bowl, whisk the may , spices, sugar and vinegar together until smooth. Add the cabbage mix and stir to coat. Place in the fridge until ready to serve to allow the flavors to combine. Set a sauce pot over medium-high heat. Saute the chopped bacon until crisp. Then pour the beans and the molasses into the pot. Season with cumin, and salt and pepper to taste. Simmer for 10 minutes. Meanwhile, heat a large skillet over medium-high heat. Add the oil, cinnamon and chili powder. Saute the spices for 1-2 minutes, then add the pulled pork to the skillet. Brown the pork for 5-10 minutes to create some crispy edges, stirring occasionally. To assemble: Toast two corn tortillas in the meat skillet until warmed and slightly crispy. Place on a plate. Add a scoop of bean in the middle of the tortilla, followed by the pork “carnitas” and the coleslaw. Drizzle with bbq sauce. 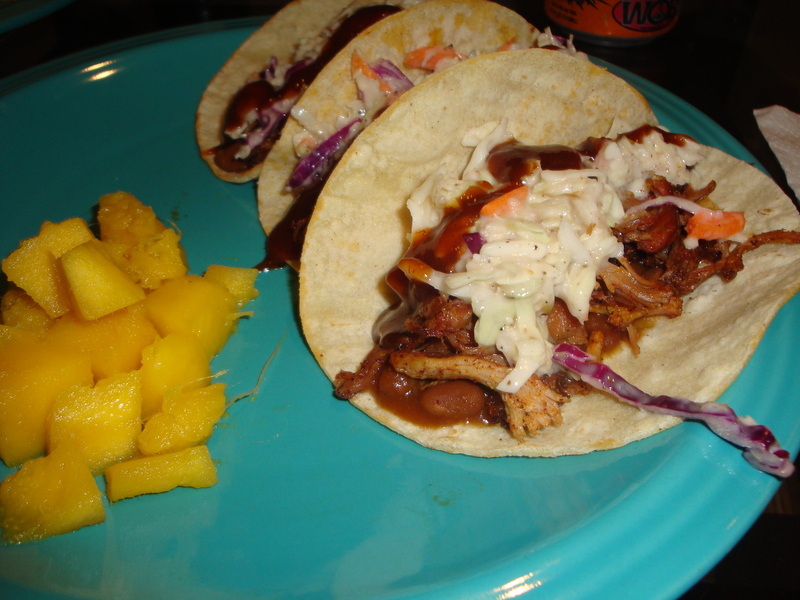 Posted on November 20, 2013 by Jilly G	• This entry was posted in Recipes and tagged bbq, beans, carnitas, cole slaw, tacos. Bookmark the permalink. Pingback: Home Made Pulled Pork ! <3 | Mmm, Taste This!